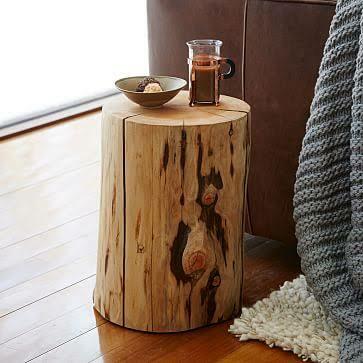 I had been wanting a tree stump table like I have seen at West Elm, but when I look at it in the store, I realize that I can make it. We have a yard full of 20 year old Bradford Pear trees, and every time the wind blows, they split and fall. They are the prettiest trees except for when they are flat on the ground. After our last storm, we lost a large one. 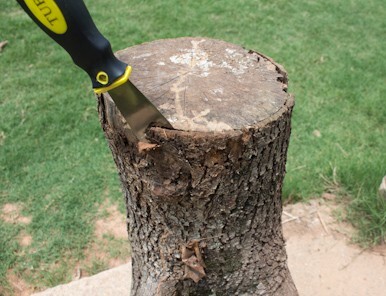 I knew that I wanted to use the trunk of one of the trees for a table, and my husband knew that he did not want to have to carry the stump all the way to the street for pick up. 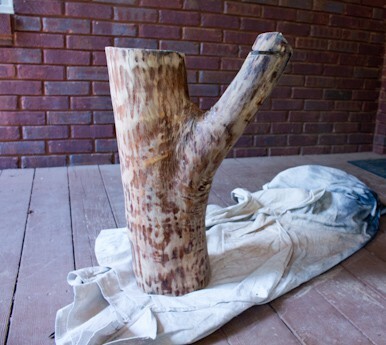 So a tree stump table, it will be! 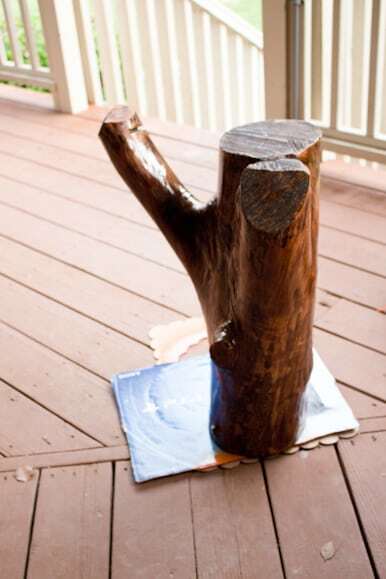 I have seen several posts on Pinterest for DIY tree stump tables, so I read up! I let the stump sit outside for about two or three months to dry out. I did spray it lightly for bugs after I drug it up to the back deck. I played around with some tools and found that starting with a putty knife and hammer worked best. 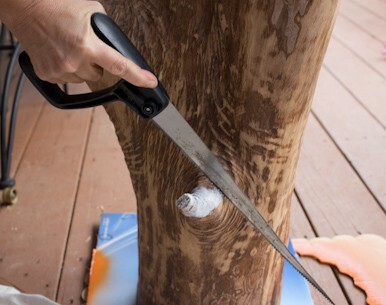 The putty knife is thin enough to get under the bark. I tapped the end of the putty knife with a hammer to loosen the bark. 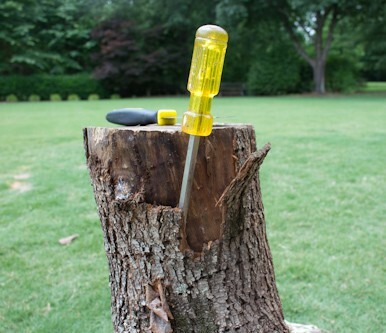 I then moved to a heavy duty screw driver, and tapped the end with the hammer. The bark seemed to come off fairly easy. The bark starting coming off in large pieces, and I was so pleased. I have to say that I have made another one to use as a plant stand, and the bark was a little harder to remove. I do not have any idea why. 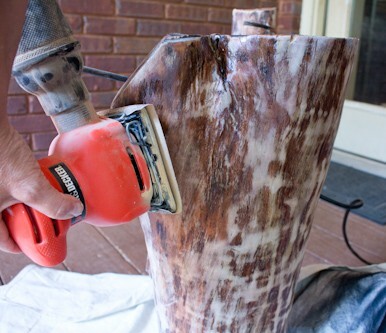 I sanded the stump with a palm sander using 100-grit sandpaper and ending with 220-grit sandpaper. I wanted my stump to be darker to match the decor of our lake house, so I did not completely remove the darker color of the wood. 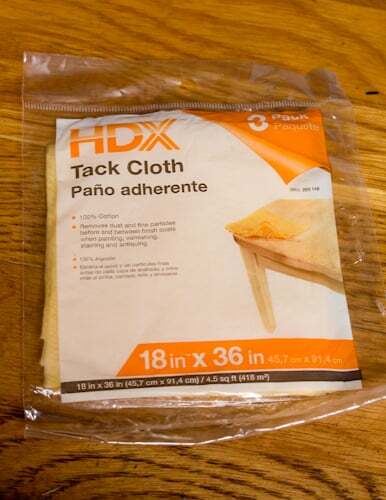 *Important Tip: You need to use a tack cloth to remove all of the dust, because the dust gets in all of the grooves and crevices. I had played with a few colors of stain on a piece of the stump that I was going to remove. I decided white was not the color for me, and I removed the piece with a hacksaw. After using a tack cloth to clean the stump, I stained the stump with Mini Wax Dark Walnut Stain using an inexpensive foam brush. 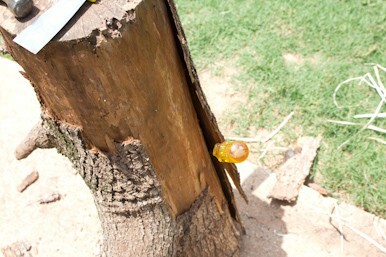 It did not take very much to completely stain the stump. 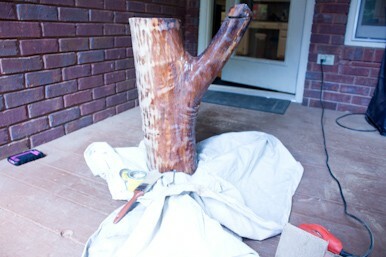 I let the tree trunk dry for over a week before I applied two coats of polyurethane with an inexpensive foam brush. I had an acrylic table top in my garage that I thought would make a good top for the table. I felt like a glass tabletop would be too heavy, so I used a chainsaw and cut a groove into the branch to make my tabletop more stable. It make me so happy to repurpose something that might be thrown away into something that I think is beautiful. 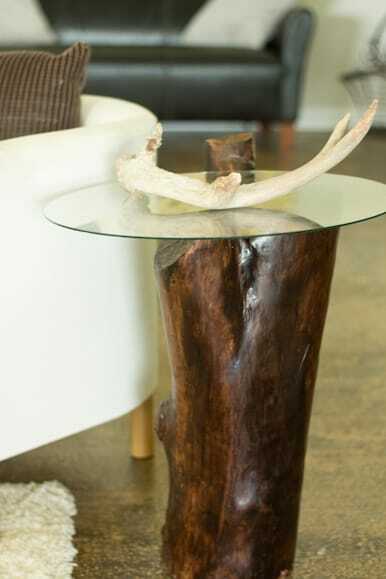 It may take a little work to make a DIY tree stump table, but it is so worth it! That is a real beauty! We had a few of these years ago and used them as stools to sit near the fireplace. Eventually we threw them in the fire! But yours is too pretty for that. Nicely done, Sherry! In an art gallery on the Oregon coast I once saw a trunk the size of a dining room table. It was just stunning. Someday I would love to do this too. Pinned! What a great project! Talk about turning lemons into lemonade! Enjoy your new table. Love it! 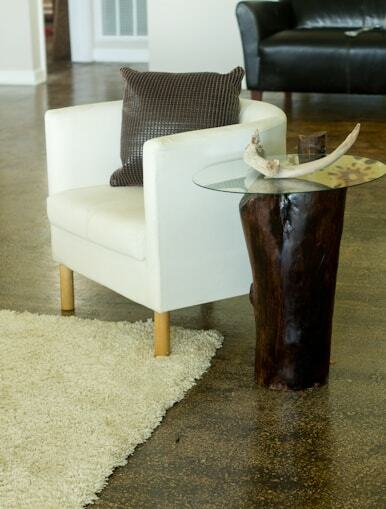 Perfect idea for a lake or ocean front property or anyone with rustic decor. Pinning to share. Sherry, this is gorgeous! I wish we’d have a big storm and some tree stumps would fall into my backyard… just kiddin…but I’d totally make one of these! I love it! Your table is beautiful. I’ll be pinning this and giving it to my retired husband. Hint, hint…maybe he can make one for our house or our red painted cottage! Hi Sherry, your trunk looks fantastic. I’ve been tempted to do the same thing , but never quite got around to it. Thanks for the motivation. And we have plenty of those Bradford Pears which do break so easily!!! I love this project! I love the idea of using an old log. Plus it looks amazing in your photos! I’ll have to pin this for later. 🙂 Maybe once I have more space, I’ll give this a try. This looks awesome dear, I have seen many different types of these tables in South Africa. Sharing on google plus. I just love your table. There is something about wood that is warm and natural. Wonderful! It must have been a lot of work, but the result was great. Thank you for linking up to the Really Crafty Link Party! Your post has been pinned to the party’s Pinterest board (https://pt.pinterest.com/pinteresab/the-really-crafty-link-party-board/). Feel free to link up other posts too, and stay tuned for the features on Friday! Sherry, love this! I need to be on the lookout for a great stump cause this is right up my alley! 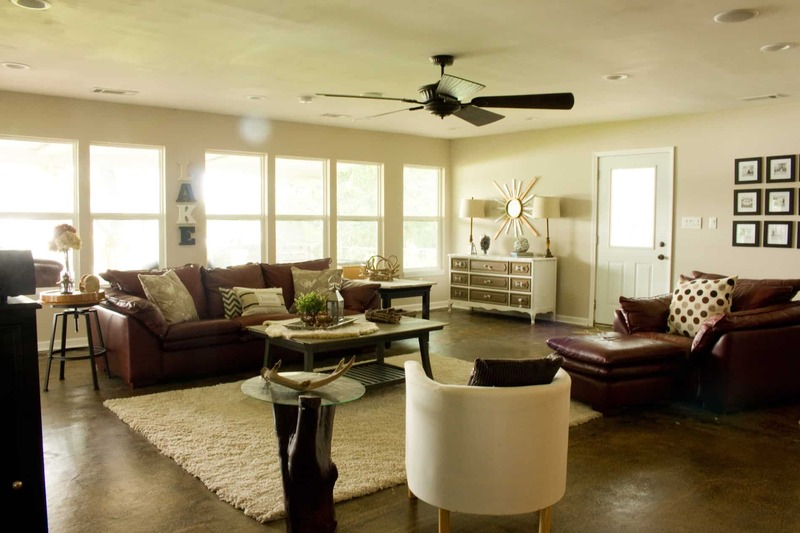 We have a more modern home, clean, stream lined and I love to put some rustic touches here and there, like your home. I love your living area, and those windows are gorgeous! 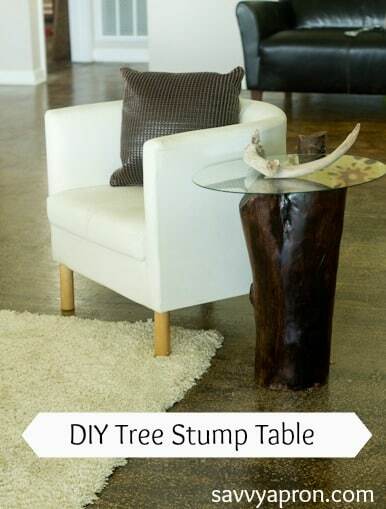 I’ve pinned this for when I find the perfect stump! Thank you for your kind words, Nikki! When I saw how many windows that were in the house, I knew I wanted to buy it! I love this table so much! And your house is absolutely gorgeous. Thanks so much for stopping by Inspiration Thursday last week. I hope to see you again! I love it! Thanks for sharing your process with us at Snickerdoodle Sunday. Pinning and tweeting to share. Hope you are have a wonderful week! How fun and thrifty! Thanks for sharing at our create-share-inspire link party! Hope to see more of your work! Looks great, & it must be rewarding to have done it yourself! Love, love it, love it! It looks so nice in your home, too! Thanks for bringing this by Throwback Thursday, too! This is beautiful! You’ve given a great tutorial, as well. Thanks so much for sharing at Snickerdoodle Sunday. I’ll be featuring your table at tomorrow’s party. I love this idea. And the tutorial is great! Wow, I love it! Turned out beautifully. This is gorgeous! It definitely looks like if you bought it in a store it ould be $$$! Fantastic job! This is gorgeous! You put a lot of hard work into transforming this tree stump. It’s an awesome piece! Thanks for sharing your project with us at Funtastic Friday. Thank you. Your table looks very nice. I think you really skilful and refined. super! thanks for sharing the steps in so much detail. I’ve always wanted to try making one of these, and thanks to you, one day I just might do it. These table look very beautiful and unique. My husband likes to make some DIY projects like this. I will give this post for him. Thank so much ! I thought this looked amazing and you can’t imagine how expensive these costs when bought from a furniture shop! 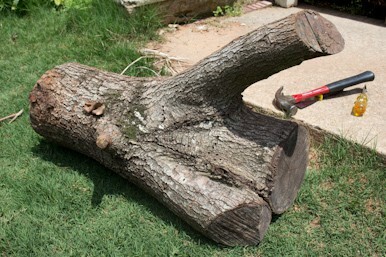 Where did you buy this tree stump, by the way? Kristine, The tree stump came from our backyard. We had a tree fall during a storm, and we cut a section of the trunk to make the table.